Education institutions are rapidly adopting 802.11 wireless LANs to support laptop learning programs, collaborative learning, and on-line testing by providing both teachers and students ubiquitous wireless access anywhere on campus. Many institutions are now taking the next step, leveraging their WLAN by including voice services over their wireless network (VoWLAN), thereby improving staff communications and providing mobile communications in the event of a school emergency. However, voice has its unique requirements and challenges to provide seamless roaming and toll-quality calls. Attend this webinar to learn how best to plan up front to support VoWLAN, or adapt your current network for better results. You have all seen Steve Job’s disbelief when he unveiled the iPhone 4 Live Demo, and it didn’t work. But we are not talking about Steve Job’s or the iPhone 4 “Wi-Fi meltdown”. We’re talking about you – this critical moment could happen to all of us – and you need to understand how this happened and how such a failure could have been easily prevented. Join Craig Mathias, Principal of the wireless and mobile advisory firm Farpoint Group, and wireless networking experts from Meru Networks for a frank and revealing discussion of the problems involved – and the solutions available – in building robust, reliable, and, yes, large-scale Wi-Fi installations. Join wireless networking industry expert Joe Epstein for a free 45 minute webinar on achieving reliable and secure toll-quality voice calls on a wireless LAN network. Taking an existing wireless LAN network used for data traffic and adding voice capabilities may sound simple, but in practice it can cause disruption in data and voice traffic as well as creating significant IT overhead to achieve and maintain the overall network quality and reliability. The first 40 attendees who ask Joe a question about voice-over-WLAN (VoWLAN) will receive a FREE signed copy of the recently published “Scalable VOIP Mobility: Implementation and Deployment” by Joe Epstein. This limited time offer is a $64.95 value, so please register now. Join education IT expert Jake Smith, Consultant with Mesquite ISD, and wireless networking guru Cal Calamari for an interactive 45 minute webinar on the keys to avoiding common pitfalls when designing wireless LANs for schools and districts. Not only can Jake address problems like how to get all students logged on simultaneously, but also how to convince your district that leveraging the latest networking technology can reduce ongoing IT expenses and overhead. In addition, Cal will cover how the recently ratified 802.11n standard can unleash new school education applications, and brings in new capabilities including high quality video, voice for emergency communications, location-based services, and more. If you are planning to implement wireless LAN in your school, this webinar will cover what you need to know so achieve wireless nirvana. If you are already down this path, come share your experiences and find out how to overcome existing issues with guidance by Jake and Cal. Universities and colleges everywhere are depending on wireless LAN as the primary network access for students, professors, staff and guest. The wireless LAN must be pervasive, robust and secure. Students bring a plethora of Wi-Fi™ devices including iPhones, iPads, Blackberries, laptops, Netbooks, and gaming consoles to campus and expect to use them on the Wireless LAN everywhere and anytime. How are universities providing wireless coverage? How are they dealing with the large influx and variety of WiFi device types? How are all these devices authenticated and managed without impacting the network performance which may affect everyone? Join us and learn how Franklin and Marshall College tackle these issues across their campus. 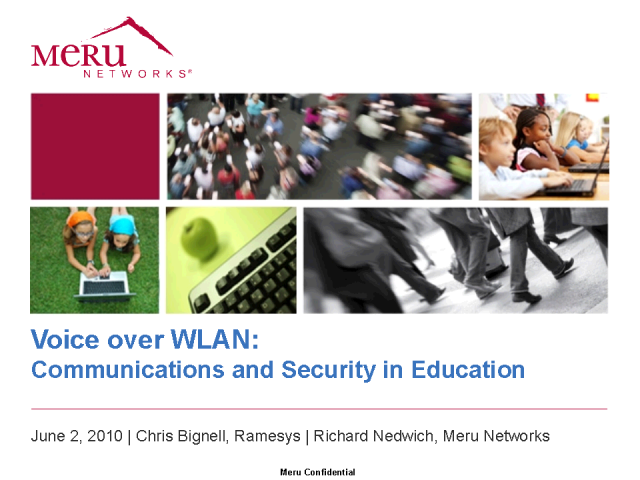 Plus hear from Meru Networks and Bradford Networks what they see being deployed as the best practices for Wireless LAN security in higher education. Mobile health (or mHealth) depends on making your wireless network reliable, predictable, and secure. In this presentation experts from Meru will highlight how virtualization and other recent innovations can both achieve these goals and create a low ongoing IT support cost. Achieving that is not always easy, because traditional wireless networks are inherently unpredictable and unreliable, and often it is through painful learning experiences and a large amount of IT support that the wireless networks meet the needs of healthcare. Attend this session and learn to avoid the traditional pitfalls that increase mHealth risks for healthcare providers. Mobile health relies on a wireless network that can handle the unpredictable healthcare environment. In this webinar you will learn how to avoid to resolve common mHealth problems like dropped voice calls, missed barcode scans, and poor data transfer from patient telemetry equipment. There will be time for Q&A, so bring your toughest questions. Overview of Meru Networks and it's unique technology for delivering lower costs, higher efficiencies, and exceptional user experience for wireless network deployments. Enterprises using wireless networking for business-critical applications belong to a diverse range of industries and geographic areas. They have an equally diverse range of reasons for choosing wireless: universities require very high bandwidth density for all-wireless dorms; manufacturing companies need smooth roaming for telephony users; hospitals demand rock-solid reliability for critical patient monitoring systems. And there are enterprises that need all of these and more. The one thing these companies all have in common is that they derive real strategic value from the wireless LAN and wireless access is not a second-class network to be used only when an Ethernet port is unavailable. This channel will help you learn about the benefits and real-world experiences of becoming an All-Wireless Enterprise.